Starting this blog was a long time in the making. But how should I begin? I contemplated starting with a post about the causes of bedwetting, different approaches to treatment, medications that are typically prescribed or the use of a bedwetting alarm. Then I dug a bit deeper. I decided that, after all, the reason we are all here is because behind every bed wetter is a human being – a child or adult – who is affected by the condition. They are the “silent sufferers”, and that includes parents and siblings who are involved in the nightly routine. I believe that before understanding the technical aspects of what bedwetting is all about, we need to remind ourselves of the people who are personally affected. This understanding is fundamental for helping the child to stop bedwetting, so, with your permission, a few personal words. Yes, young man; I did understand you. I know what it feels like to be a bedwetter. I have a confession to make. I, myself, was a bedwetter. It has been over 55 years and I remember it all too well. I remember that my parents used to wake me and my brother and take us to the bathroom (the most common mistake that today I advocate against – but that is for a future blog post). They were never angry with me or blamed me for wetting my bed, and I am very thankful for that. Treatment wasn’t an option at that time. However, there is one incident that I’ll never forget for as long as I live; I was 8 years old and slept over for a few nights at my cousin’s house. One morning, I woke up completely soaked in urine, having had a very big accident during the night. I was so ashamed that I attempted to hide it by refusing to get out of bed for a few hours in the hope that it would be dry by then. Thankfully, I stopped wetting the bed not too long after that. Years passed and I pursued a career as a psychotherapist, specializing in family and marriage counseling and treatment. When I became a father of 4 wonderful children, my eldest son, at that time age 6, was a bedwetter. I didn’t know how I could help him. We were living in England where I was working, and his pediatrician referred us to a hospital clinic specializing in Enuresis. My son went through a comprehensive diagnosis with no findings. He received medication with no improvement. I used to take him to the clinic every few weeks during which the nurse checked his height and weight and some other physical parameters each time, which to this day I do not understand, considering he was seen by a doctor. I remember his miserable face when he woke up every morning in his wet bed; he looked so helpless and my wife and I felt the same. He looked at us; said nothing, but his face said it all. One of the most difficult things for a parent is when they see their child’s suffering; we feel helpless and don’t know what to do to make it better. At that moment, I made a commitment; no matter what, I would not rest until I had helped my son stop having accidents at night. I realized that the current available treatment wasn’t working and every visit to the clinic was just more of the same. I asked the doctor if he had any other course of action that we should consider. The doctor mentioned the usage of a bedwetting alarm and referred us to an agency that rented them out. We received basic information how to operate the device, which was quite cumbersome and not user-friendly. I vaguely remembered from my Psychology courses what a bedwetting alarm was. We started the treatment but faced many problems; my son didn’t wake when the alarm went off and I didn’t know what to do next. I went to the university library and read anything I could get my hands on about bedwetting and the enuresis alarm (the internet didn’t exist yet). The more I read the more I understood bedwetting and the logic behind the use of the alarm. I combined the treatment with other elements of Cognitive-Behavioral Therapy which I felt that could be beneficial. His first dry night occurred after two weeks! The smile on my son’s face (and of ours as well) was unforgettable. Gradually, he succeeded with more dry nights and eventually stopped wetting completely within 3 months. It was a life-altering event. If I could help my own son to grow out bedwetting, why not help other children who suffer from bedwetting and are struggling just like we were? I knew that my career as a marriage and family therapist was about to end. From that moment I devoted my entire professional career to the treatment of bedwetting. I specialized in the Psychophysiology of Enuresis with an emphasis on the relationship between Enuresis and depth of sleep. I’m heavily involved in research, I lecture in scientific conferences and in academic institutions, but most important, I’m proud to say that I’ve helped tens of thousands of children, teenagers and adults to stop bedwetting and to improve the quality of their life. But I’m not alone; my eldest son Tal (yes, the 6 year old ex-bedwetter) is my colleague and partner. 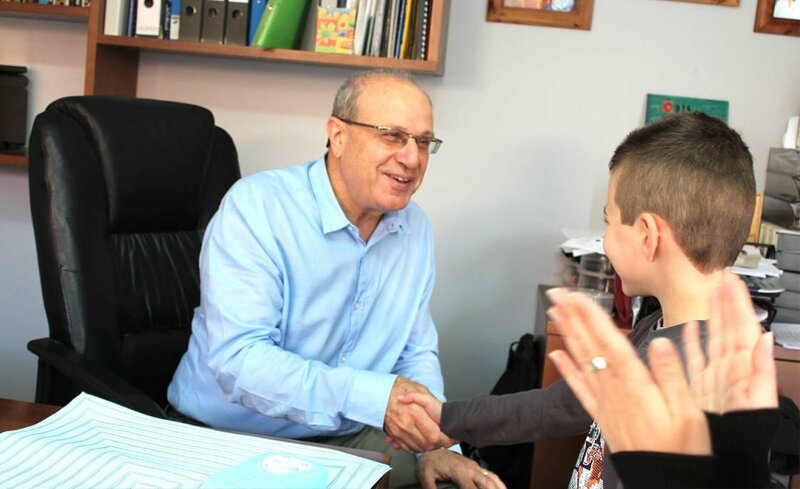 Seeing the power that this change can make in a child’s life, he also decided to dedicate his professional career to the treatment of bedwetting. He is currently a doctorate student, researching bedwetting of course. Tal is the man behind the revolutionary invention, THERAPEE, the first online interactive bedwetting treatment kit in the world. His invention enables millions of children with bedwetting problems to benefit from the successful Multi-Modality treatment from the comfort of their own home. We are so proud to see the encouraging responses and reviews that we receive from thankful parents and children worldwide; it motivates us to keep striving for better solutions to improve the quality of life of so many bedwetters. In April 2014, I will commemorate and celebrate 30 fruitful years of bedwetting treatment. I look back in pride and satisfaction but moreover, look forward to offering a better future for those children that are still suffering from this treatable condition.